The Sahidic Coptic version corroborates early Christian Christology in many of its readings. This is especially true regarding the doctrine of the Trinity, since the most that can be read from Coptic John 1:1c is that "the Word was divine," not "the Word was God." Literally, what the Coptic version says is "the Word was a god." This is consistent with what historians know about the development of the doctrine of the Trinity. As one edition of the New Encyclopedia Britannica puts it, "Neither the word Trinity, nor the explicit doctrine as such, appears in the New Testament....The doctrine developed gradually over several centuries and through many controversies." (Micropedia, Volume X, p. 126) It was not until the 4th Christian century that the doctrine of the Trinity was firmly established in the churches. Likewise, the book Encyclopedia of Early Christianity, edited by Everett Ferguson, says, "Primitive Christianity, like Judaism, was distinguished from paganism by its unqualified monotheism." (page 912) This "unqualified monotheism" also distinguished the Christology of primitive Christianity from later Trinitarianism. Since the Sahidic Coptic version pre-dates the 4th century, being dated in the late 2nd or early 3rd century, it is not surprising that it does not labor under the doctrine of the Trinity. Not only does the Coptic version refrain from identifying Jesus as God Almighty at John 1:1c. It also does not contain the Trinitarian addition at 1 John 5:7 ("these three are one"), nor speak of 'the church of God which he purchased with his own blood,' (Acts 20:28) nor does it say that 'God was manifested in the flesh.' (1 Timothy 3:16) Rather, it speaks of the "church of the Lord" and says merely "this one who" was manifested in the flesh at 1 Timothy 3:16, not "God." Nor does it contain the added words at John 3:13, "[the Son of man] who is in heaven," which incorrectly indicates that Jesus could be God in heaven and Man on earth at the same time. Instead, like the earliest extant Greek manuscript of the Gospel of John, the p66 [Papyrus Bodmer II], the Sahidic Coptic text omits that unauthorized addition. Other renderings of the Sahidic Coptic version also corroborate the fact that early Christian Christology, while an exalted Christology, was 'unqualifiedly monotheistic,' not Trinitarian. The Coptic readings are theologically neutral and frequently very literal readings of the New Testament Greek text. Coptic John 1:1c: What Conclusions Can Be Drawn? Relative to Coptic John 1:1c, what conclusions can be drawn from a multi-year study of the Sahidic Coptic language, including a detailed study of the entire Sahidic Coptic New Testament? 1- That the translation of Coptic neunoute pe pSaje into standard English as "the Word was a god" is literal, accurate, and unassailable. It is simple, but not simplistic. It is what the Coptic text actually says and literally conveys. Any other translation of it amounts to interpretation or paraphrase. 2- That rendering a Sahidic Coptic common ("count") noun, like noute, god, when bound to the Coptic indefinite article, ou, into English as "a" + noun is so prevalent, as for example in Coptic scholar George Horner's 1911 English translation of the Sahidic Coptic New Testament, that this is beyond dispute. As just the nearest example of this, after John 1:1c itself, is John 1:6. Here we have the Coptic indefinite article, ou, bound to the Coptic common noun rwme, man: aFSwpe nCi ourwme eautnnoouF ebol Hitm pnoute . In Horner's English translation we read: "There was a man having been sent from God." That is the simple, literal, and accurate translation. Likewise, "a god" is the simple, literal, and accurate translation of ou.noute at John 1:1c, the same Coptic indefinite article + common noun construction as found in John 1:6 and elsewhere. Only with respect to Coptic "mass" or abstract nouns is there no need to translate the indefinite article into English, but this is not the situation at Coptic John 1:1c, because noute, god, is a Coptic common or "count" noun. 3 - That, whereas some Coptic grammarians hold that ou.noute may also be translated into English adjectivally as "divine," they give no examples favoring this usage in the Sahidic Coptic New Testament itself. Coptic ou.noute is not used adjectivally or "qualitatively" in the Sahidic Coptic New Testament. The published works of these scholars have been heavily invested in the Nag Hammadi Gnostic Coptic "gospels" like Thomas, Philip, and Judas. Perhaps translating ou.noute as "divine" fits the esoteric or philosophical context of the Gnostic "gospels." But there are no examples in the canonical Coptic New Testament that justify an adjectival translation of ou.noute as "divine," whereas a literal translation of ou.noute as "a god" works just fine. Although "divine" is not altogether objectionable, since a god is divine by definition, a paraphrase is unnecessary when an adequate, understandable literal translation is available. 4- That all the primarily Trinitarian-based objections to translating ou.noute as "a god" at Coptic John 1:1c amount to little more than presupposition or special pleading. Though such faulty, superficial objections have been cut and pasted frequently on the Internet, they are poorly researched and often misleading. In one such apologetic, promising full disclosure of what some Coptic scholars "really said," the conclusion about ou.noute at John 1:1 remains the same, i.e., "it might mean was a god, was divine, was an instance of 'god', was one god (not two, three, etc. )"; "In Coptic, "ounoute" can mean "a god" or "one with divine nature"; "So literally, the Sahidic and Bohairic texts say "a god" in the extant mss. ... A rather clumsy reading might be: The Logos was in the beginning. The Logos was with God. The Logos was like God (or godlike, or divine) with the emphasis on his nature; not his person." Not ONE of the scholars appealed to by Trinitarian apologists said that Coptic John 1:1 should be translated to say "The Word was God." Not one. Not one said that "a god" was incorrect. In fact, the interlinear reading for Sahidic Coptic John 1:1c in scholar Bentley Layton's Coptic in 20 Lessons specifically reads "a-god is the-Word." The Coptic text of John 1:1c was made prior to the adoption of the Trinity doctrine by Egyptian and other churches, and it is poor scholarship to attempt to "read back" a translation such as "the Word was God" into any exegesis of the Coptic text. Such a rendering is foreign to Coptic John 1:1c, which clearly and literally says, "the Word was a god." 5- That, stated succinctly, translating Sahidic Coptic's neunoute pe pSaje literally into standard English as "the Word was a god" stands on solid grammatical and contextual ground. Does Coptic John 1:18 contradict Coptic John 1:1? It is clear that Sahidic Coptic John 1:1 says that "the Word was a god." But it has been remarked that Coptic John 1:18 contradicts this, because this verse uses the Coptic definite article before the common noun, noute: p.noute, with reference to the Son. But is this reference definitizing, equating the Son with God, or is it merely anaphoric, referencing "the" god of John 1:1c? First, an important difference between John 1:1 and John 1:18 (in Coptic and in Greek) must be noted. John 1:1 reads the same in all extant ancient Greek and Coptic textual witnesses. But John 1:18 does not. John 1:18 does not possess the textual clarity of John 1:1c. John 1:18 is a text that has three significant variants in the Greek: monogenhs theos ("an only-[begotten] god"); ho monogenhs theos ("the only-[begotten] god"); and ho monogenhs huios ("the only-[begotten] son"). By putting the definite article here, the Sahidic Coptic translators mirror the Greek's ho monogenhs theos. But does this say the Word is God? No, for the Greek here can be translated simply, "the only-begotten god." George Horner's English translation of the Sahidic Coptic renders pnoute pShre nouwt as "God, the only Son." But this is not what the Coptic says, this is merely Reverend Horner's English version of the Coptic, perhaps revealing his own theological presuppositions. The Coptic of this verse, John 1:18, can also be translated as "the god, the only son." The use of the Coptic definite article here does not demand the translation, "God." Particularly not when such a reading fails to correspond with the context and with what has already been stated at Coptic John 1:1 in both the Sahidic and the Bohairic versions: "the Word was a god." Horner himself shows that not every instance of p.noute means "God," but may also mean "god," in context. For example, at Acts 7:43, the Sahidic Coptic text has the definite article bound to the word for god, p.noute. Does Horner arbitrarily translate it as "God"? Not at all. He renders p.noute at Acts 7:43 as "the god," giving us "And ye took the tabernacle of Molokh and the star of the god [Coptic, p.noute] Rephan, the forms which ye made to worship them." Likewise, at Coptic John 1:18 we have "the god, the only son," i.e., the god previously mentioned at John 1:1c, who is the Son of God. This is so because both John 1:1 and John 1:18 describe a contrast between God and his Son. In John 1:1, the Son or Word is "with" or "in the presence" of God. At John 1:18, God is the One Whom no one has ever seen, whereas the Son is the one who represented or revealed Him on earth. Identity of the Son with God is not the theme of either John 1:1 or John 1:18, whereas contrast is emphasized. Sahidic Coptic John 1:18, therefore, cannot be used to contradict John 1:1, because the translation, "God the only Son" is not the only possible or contextually accurate translation of this Coptic verse in English. John 1:18 is not identifying the divine Son as being the same as God Almighty, but is actually highlighting the distinction between them. This earliest Coptic (from an Arabic/Greek word for “Egyptian”) translation was in the Sahidic dialect, approximately 1,700 years ago. The scribes who were translating the Gospel of John from Koine Greek into their own Egyptian language encountered an issue that still faces translators today. It is the question of correctly translating John 1:1. Many ancient Sahidic Coptic manuscripts were collated and translated into English by Coptic scholar George W. Horner. In 1911, Horner published an English translation of John’s gospel. He rendered John 1:1c as: “In the beginning was being the word, and the word was being with God, and [a] God was the word.” 2 He encloses the indefinite article “a” within brackets, which might indicate that he considered that here its translation is not required in English. However, in his own translation of the same Coptic sentence structure in other verses in John, Horner himself does render the indefinite article in English as “a”, without any brackets, which is entirely proper at John 1:1c also. Thus, while it can be said that the Sahidic Coptic indefinite article does not correspond exactly in usage to the English indefinite article, it does correspond closely to it. 7 Because at John 1:1c, the Coptic indefinite article is bound to a common noun and refers to an entity, the Word, the translation “a god” is proper. How competent were the ancient Coptic Egyptian translators to convey the sense of the Greek text of John? Egypt was conquered by Alexander the Great in 332 BCE and the country was subsequently Hellenized. Greek had been a legacy of Egypt for some 500 years by the time those translators began their work, and it was still a living language. 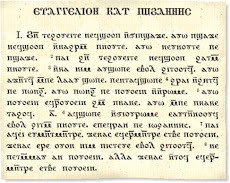 According to Coptic grammarian Bentley Layton, the Sahidic Coptic translation is “a very early indirect attestation of the Greek text and a direct indication of an Egyptian (perhaps Alexandrian) understanding of what it meant.” 8 Likely made well before Nicea (325 CE), the Coptic text tells us how early exegetes interpreted John 1:1, apart from the influence of later dogma and church tradition. There is also the matter of precision in rendering John 1:1c. The Koine Greek language has only the definite article, with indefiniteness being indicated by the lack of the article (called the “anarthrous” construction). Of the other early translations from the Greek, Latin has no articles, definite or indefinite, and Syriac has only the definite determinator in its grammatical structure. The Sahidic Coptic language, however – like English – has both the definite article and the indefinite article as part of its syntactical system. It is sometimes charged, incorrectly, that the translation of John 1:1c as “the Word was a god” is an incorrect, sectarian translation found primarily in the New World Translation of the Holy Scriptures. Yet, in rendering John 1:1c from Greek into their own native language, the Coptic scribes came to the same understanding of that Greek text some 1,700 years ago. Translating John 1:1c literally to say “the Word was a god” is, therefore, not any innovation. Rather, it appears to be an ancient way of understanding the meaning of this text, before the ascension and formal installation of philosophical Trinitarianism. 11. This is the writer’s personal observation in researching the Coptic text. 1. Crum, Walter. A Coptic Dictionary. Oxford: The Clarendon Press, 1939. 2. Horner, George W. The Coptic Version of the New Testament in the Southern Dialect. Vol. 3. Oxford: The Clarendon Press, 1911. 3. Lambdin, Thomas. Introduction to Sahidic Coptic. Georgia: Mercer University Press, 1983. 4. Layton, Bentley. Coptic in Twenty Lessons. Leuven: Peeters, 2007. 5. Metzger, Bruce. A Textual Commentary on the Greek New Testament. 2nd Edition. Stuttgart: Deutsche Bibelgesellschaft, 1994. 6. Shisha-Halevy, Ariel. Coptic Grammatical Chrestomathy. Leuven: Peeters, 1988. In the Greek text we have an anarthrous theos (“god”) in the accusative, and in some Greek texts it is also pre-verbal: theon auton einai instead of auton einai theon. I have no problem with the premise than an anarthrous theos may express quality or character rather than identity when it comes to rendering it in English qualitatively as “divine” or even “deity” rather than “a god.” But I consider this, grammatically speaking, to be a distinction without a significant difference. The Coptic of this part of Acts 28:6 says literally, “they turned themselves around, they said , ‘(He) is a god.’” The Coptic translates the Greek literally here, where metabalomenoi means they “changed sides” or “turned about” in the sense of changing their opinions or minds. Acts 28:6 is missing in Coptic scholar George Horner's Sahidic Coptic text and English translation, but it is found in J. Warren Wells' Sahidica text. It is also found in Horner's Bohairic Coptic text, where Horner translates the comparative Bohairic ou.nouti pe into English as "he was a god." It is telling that none of the above translators saw fit to render the anarthrous theos of the Greek text of this verse qualitatively rather than as an indefinite noun. Coptic John 1:1 -- Ambiguous? According to Dr. Jason D. BeDuhn, the Greek text of John 1:1 is, grammatically, not a difficult verse to translate. "It follows familiar, ordinary structures of Greek expression." (Truth in Translation, 2003, p. 132) Dr. BeDuhn would render the Greek of John 1:1c literally as "and the Word was a god," or in "a slightly polished" variant carrying the same meaning, "and the Word was divine." According to BeDuhn, the traditional, Latin Vulgate-inspired reading formalized by the King James Version, "and the Word was God," is the least accurate rendering of the Greek text, a reading that violates the grammar and syntax. The same conclusion can be readily drawn about the Sahidic Coptic translation of John 1:1c. This is a fairly literal translation of the Greek, made in the 2nd or 3rd century of our Common Era, at a time and place where the Koine Greek of the New Testament was still a living language and widely understood in Egypt. In regular Coptic syntax, auw neunoute pe pSaje means, straightforwardly, "and the Word was a god." And just as the Greek sentence at John 1:1c may express a qualitative force, the Coptic syntactical unit which corresponds to that Greek sentence may express an adjectival force. In other words, both may also be rendered as "and the Word was divine." (Cf. Bentley Layton, Coptic in 20 Lessons, 2006/7, pp. 7, 34) But is this ambiguity? No, for as Dr. BeDuhn states, both translations carry "the same basic meaning." Still, some scholars are not satisfied with even their preferred "qualitative" meaning for John 1:1c, unless they can define "qualitative" as synonymous with "definite." For example, Daniel B. Wallace, in Greek Grammar Beyond the Basics (1996, p. 269) prefers a qualitative rendering for John 1:1c, but then goes on to say that "and the Word was God" is the simplest, most straightforward translation. That is a non sequitur. John 1:1c is not carrying on a Greek philosophical dissertation about "persons" or "essences." But it is making an important distinction between "God" (Greek, ho theos; Coptic, p.noute) and another entity whom John describes simply with the Greek word theos (Coptic, ou.noute). The noun theos in the Greek of John 1:1c is pre-verbal and anarthrous. The noun noute in the Coptic of John 1:1c is in a regular indefinite syntactical unit. The force in both cases is the same: the Word is being distinguished from God, not identified as being God. Further, John 1:1b emphasizes that this Word is "with" (Greek) or "in the presence of" (Coptic) God. If, as some Trinitarian scholars assert, the idea of a qualitative rendering highlights the "nature" or "characteristics" of the Word rather than his identity, but this Word shared all the attributes and qualities that God (= the Father) has, then logically, the Word would be the Father. Yet, mainstream Trinitarians deride that idea as Sabellianism or modalism, "heresies" condemned by the church. Is Coptic John 1:1 ambiguous? Not at all. But to be sure, it is the Trinitarian scholars who are forcing John 1:1 to be "ambiguous," not the Greek nor the Coptic text. The Greek text is not definite ("the Word was God") and neither is the Coptic text. Both the Greek and the Coptic texts agree that "the Word was a god" or "the Word was divine," which mean essentially the same thing. The one verse, 2 Thessalonians 2:4, illustrates the three uses of the Sahidic Coptic articles: the Coptic zero article, the Coptic definite article, and the Coptic indefinite article. and c) anarthrous theos in the nominative. characteristic: i.e., "god"; b) definite-articled p.noute, "the god" or "God"; and c) indefinite-articled ou.noute, "a god." "The one who is opposing and raising himself above everyone who is called 'god' or regarded with reverence, so that he goes into the temple of the god and sits down, declaring publicly that he is a god." What I see here is that careful translators of the Greek text understood the Greek grammar in the same way, and translated 2 Thessalonians 2:4 into their own languages accordingly, from the 2nd century to the present day. And it is ΟΥ.ΝΟΥΤЄ (ou.noute), "a god" that is found in the Sahidic Coptic version of John 1:1c, in contrast with Π.ΝΟΥΤЄ (p.noute), "God," at John 1:1b.